No, seriously. Give it up. 1. Every time you meet someone new, it's kind of awkward because you already know everything about them. 2. Although, catching up with old friends is equally pointless, because you know everything they're going to tell you. 3. You have an encyclopedic knowledge of which universities all of your school friends went to. 4. And who they're all dating now. 5. And which foreign holidays they've been on this year. 6. Last time you realised that you liked someone, it was because you woke up with their profile on your laptop screen. Which was on your pillow. 7. You spend most of your free evenings backstalking. That's clicking left on someone's most recent photo to find their oldest. 10. And exactly what their parents and siblings have been up to recently. 11. You work out how cool new people are based on your mutual friends. 12. And you always work with your back against the wall, so no one can see who you're checking out. 13. Occasionally you come across a genuine celebrity profile. Which is profoundly exciting. 14. But every now and again, a "find out who stalks you" pop up gives you a heart attack. 15. Your biggest fear is accidentally adding your boyfriend's ex, who you definitely haven't been stalking. 16. Or liking an old profile photo you certainly weren't looking at. 17. Or mistakenly poking a stalkee. 18. Or worst of all, setting their name as your status. 19. Scrap that. Your biggest fear is opening your laptop in front of someone you've been stalking, and their profile coming up on your screen. 20. You often find yourself stalking in incognito mode so that you don't disgust yourself with how much time you spend doing it. 21. 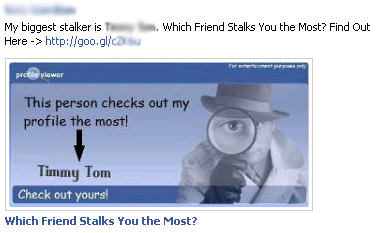 But you're the master of Facebook graph search. Private profiles don't phase you. 22. Someone's first name and the city they live in is all you need to find them. 23. And that's why everyone comes to you when they need to gather information about someone. You're performing a public service, really.